It doesn’t seem to matter if we are ready or not, Fall is creeping in all around us. The artificial pumpkins are on sale and the Christmas decorations are coming out. I am heading up to Ohio this year for a big family Thanksgiving celebration. I will enjoy the cool weather for a few days. I do love Fall. Perhaps it is the colors, I have always looked best in Fall colors, I loved getting new clothes for the beginning of school. As with any holiday, or anytime I have family gathered together, I really enjoy setting a pretty table. This is the table I set for our small celebration last year. 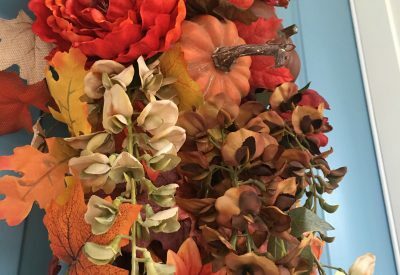 This pretty floral cloth is decorated with such rich colors and can be used most any time of year, but seems perfect for Fall. I wanted to delineate each place setting more than with just the chargers, so I added basic green woven placemats. I found these cute little owl plates at Cracker Barrel. I think they add a little bit of whimsy to each place. I tucked a parchment Fall leaf under each little owl. I really enjoy using these leaves tucked under cheeses when setting out a display, too. You can find these at gourmet stores, or just order those pretty paper leaves and have them delivered directly to you. If you haven’t used these in a cheese display, you would be amazed what a difference they will make. I love to use these chargers, they look like they are wood and carved with pinecones and pine needles, but they are actually a heavy plastic. They are made by Better Homes and Gardens for WalMart. The gold dinner plates I have had for years. The green salad plates are perfect for coordinating with those chargers, repeating the pine look. These are the Sierra pattern by Bonjour. I used these on a Thanksgiving table this year that I styled all in green and white. 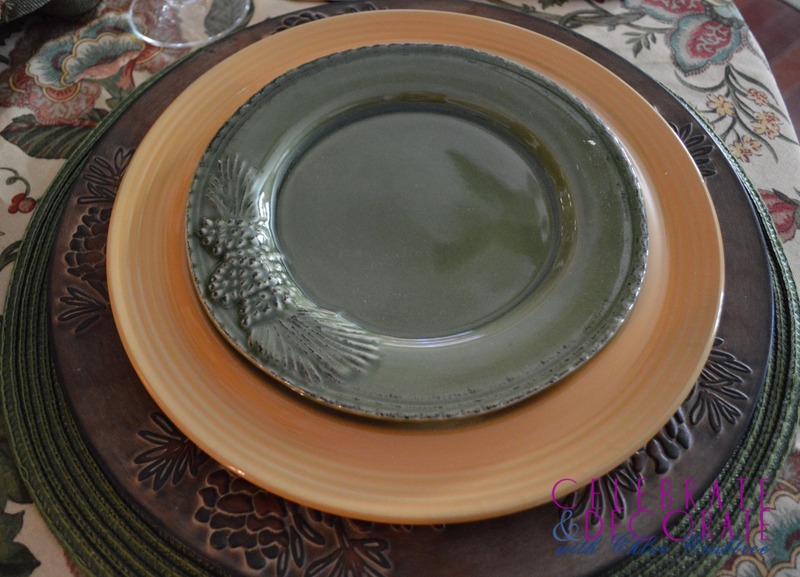 I love how this combination incorporates all of the colors of Autumn. 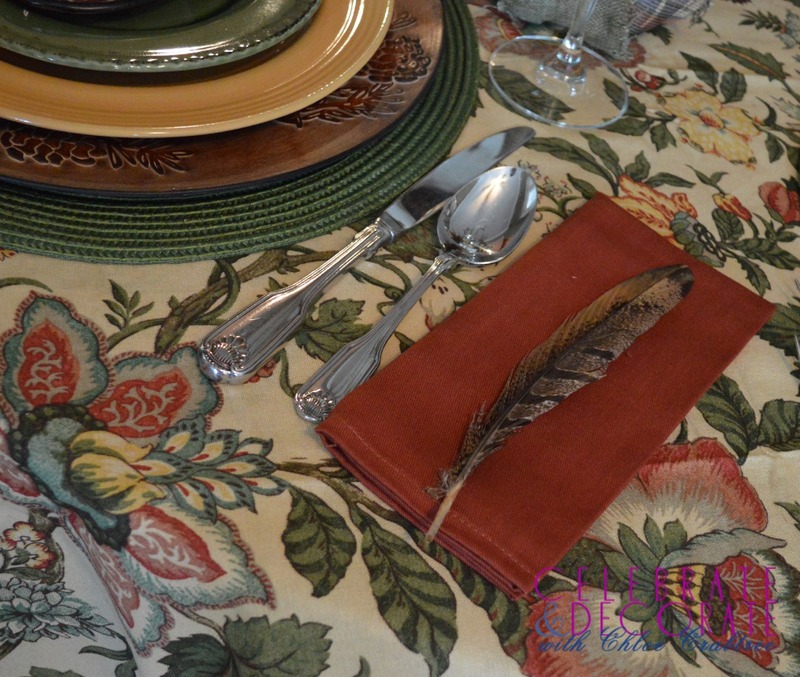 I added a variety of pheasant feathers to my centerpiece, so I thought the little feathers on the individual napkins was a nice touch. My centerpiece is meant to be a statement piece when guests arrive, and then will be moved to a sideboard. The log slice trivet it is sitting on will remain on the table to hold a hot dish and protect the the table. 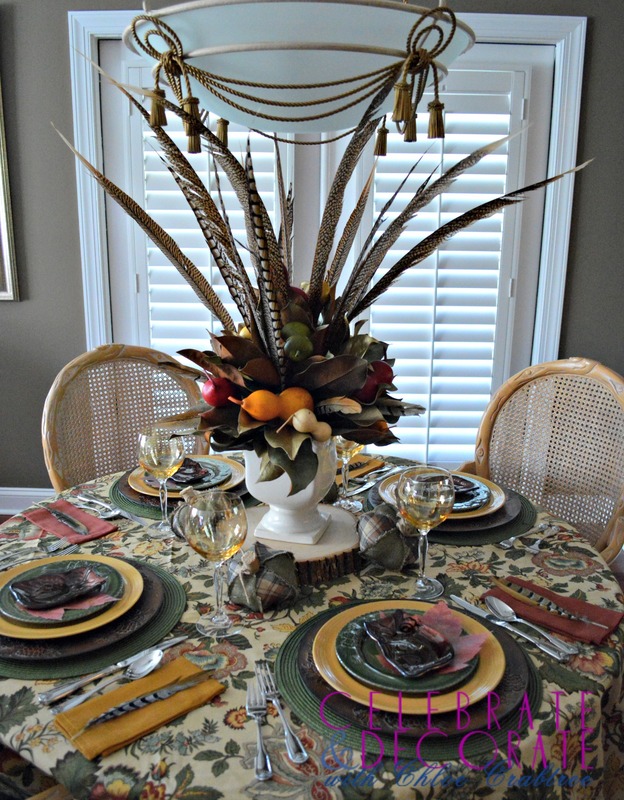 The centerpiece is an arrangement I made with magnolia leaves, artificial gourds and feathers. I sat the arrangement on a wood slice and tucked some fabric pumpkins around it. See how I created my arrangement here. May you and your family be blessed this Thanksgiving and throughout the coming year. Your table is gorgeous. I love the feather and fruit centerpiece, so pretty and unique. Beautifully done. Thanks tons for linking to Inspire Me. What a great table setting, so inviting, I ready to sit down!! you set a lovely table! Thank you for sharing. Hugs! That centerpiece is a showpiece Chloe! Thanks Sandra! Coming up this week is how I made it! Love how it’s so textured and every little piece stands out. Love that owl decor too! Thanks Nicole! I loved the little owl plates, too! I just about sucked all the air out of the room when I saw that centerpiece, Chloe! Goodness gracious, sakes alive!! 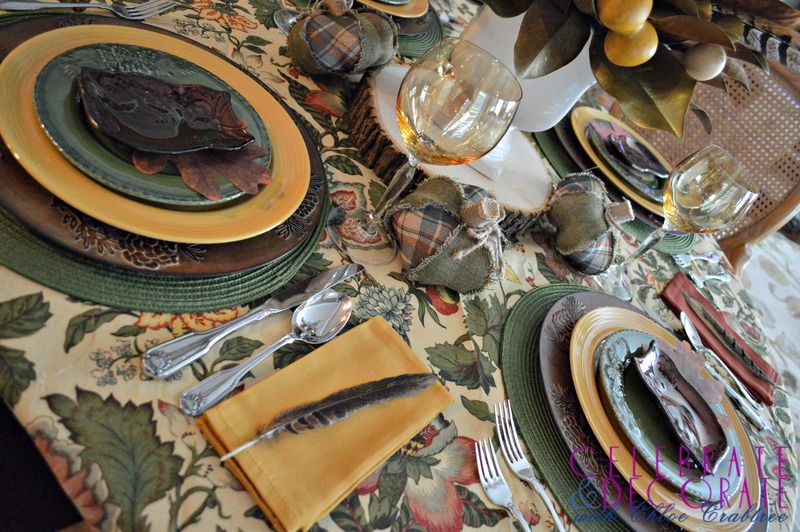 Those pheasant feathers in the centerpiece are just SO fabulous!!! They really kick it up a notch! I like the way you repeated the feather down closer to the table’s surface. Nice touch. Beautiful tablecloth, too, with such rich colors in an intricate pattern that really speaks to the fall season. Enjoy yourself in Germany! Wow…that’s going to be one wonderful Thanksgiving to remember!!! Thank you Alycia. I had fun adding the feathers. 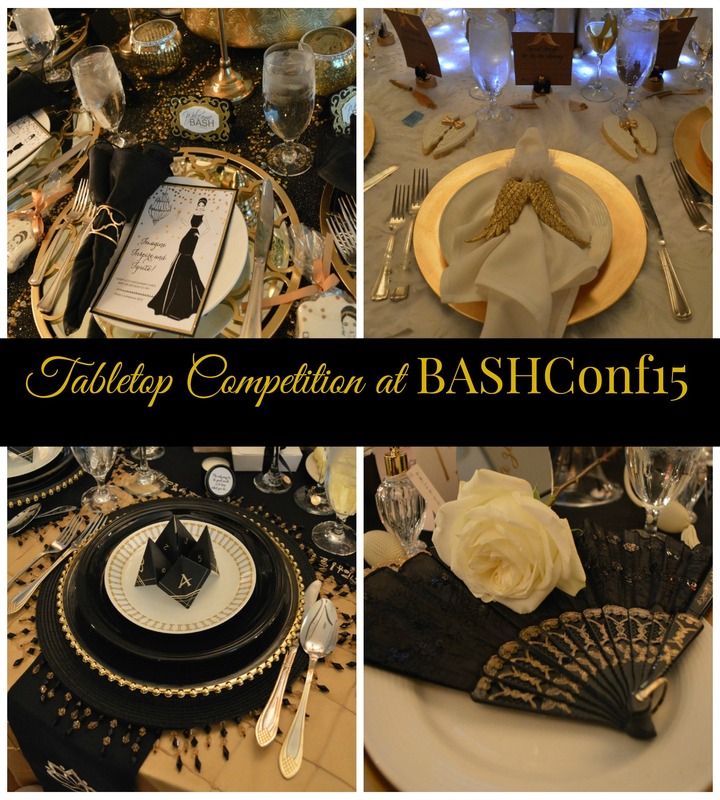 Your table is beautiful! Love the centerpiece- those magnolias really added a wow factor along with the feathers- it’s fabulous! Being in Germany sounds fascinating! I know the feeling about hoping someday everyone will be together at your home for a gathering. My son is in Oregon (2500 miles away) and daughter is south of us 200 miles along with the rest of our family. We end up traveling to see everyone. Have a great time in Germany! Lovely tablescape! 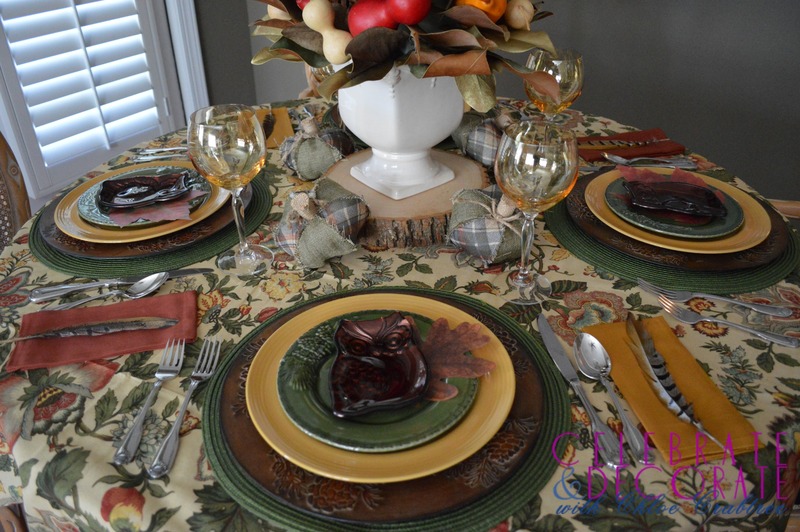 The tablecloth colors are perfect for the fall decor. i love the use of whimsical owl plates for an appitizer. Have a great time in Germany! Thank you Pam! Have a Happy Thanksgiving! Thanks Bev! I agree with you about the BH&G dishes! 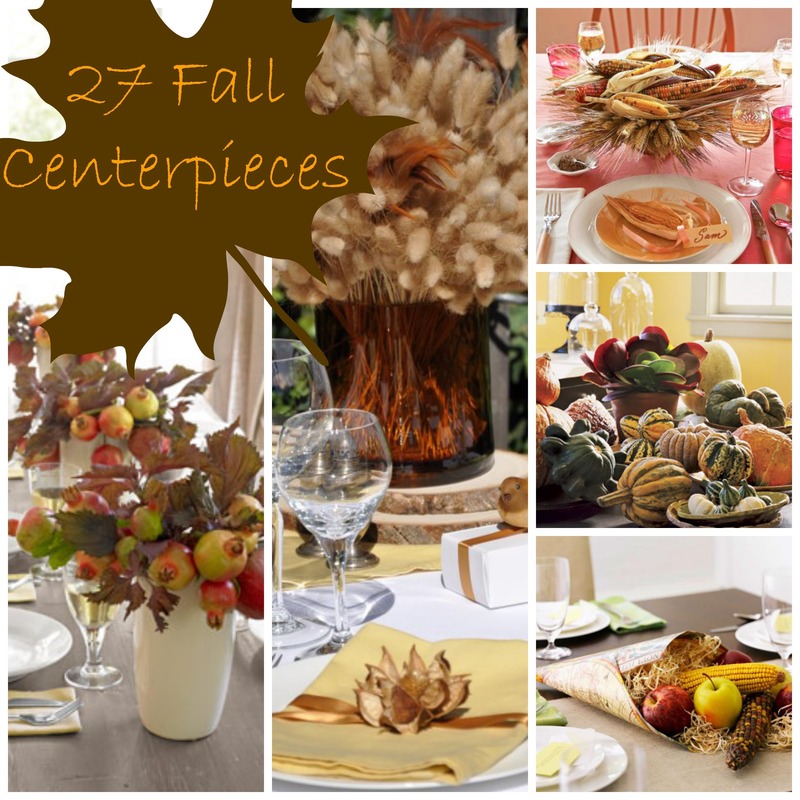 Your Fall table is gorgeous. 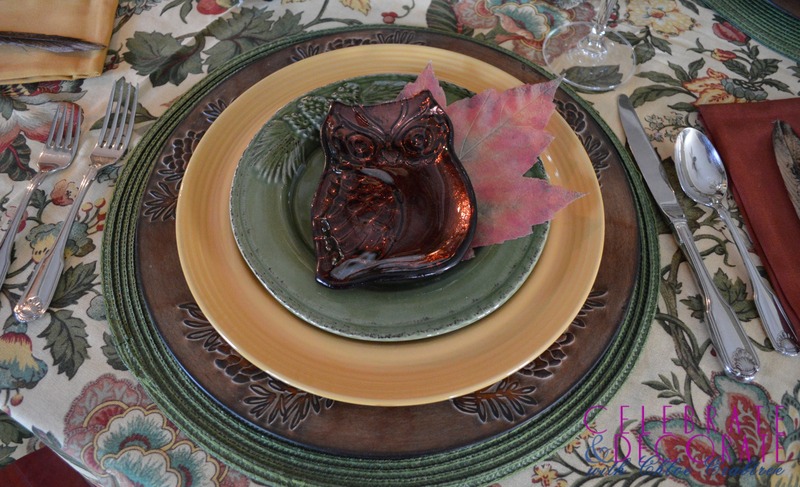 I love the centerpiece, floral tablecloth, and owl plates!! You have a great eye for styling and layering pieces. Thanks for sharing at The Creative Circle. Thanks Kathy, I look forward to sharing a tutorial on the centerpiece next week! This table is coordinated perfectly! Oh, thank you Sandra! The bowls with the green pumpkins were the final touch to bring it all together.